Enjoy your morning in the chocolate factoy, learn about swiss chocolate history. The journey begins with Aztec cocoa ceremonies and takes you through to today’s chocolate innovations. Touch roasted cocoa beans and follow your nose towards the irresistible scent of freshly made chocolate. Our chocolate tasting will titillate your taste buds with the aromas of exquisite cocoa, fresh Alpine milk and the best ingredients. Then drive to the cheese factory: Le Gruyère AOP is a cheese with a long tradition and its making has been handed down over many generations of cheesemakers both in the alpine and village cheese dairies. La Maison du Gruyère guides you through a modern world of the senses and our cow Cerise (Cherry) introduces you to the secrets of the Gruyère AOP making. Have free time for lunch in the medieval village. 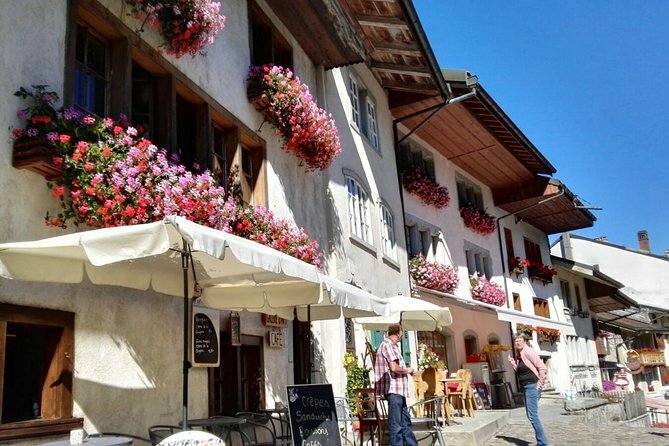 At the foot of the Pre-Alps, you will be enchanted by the charm and picturesque architecture of the medieval town of Gruyères. The town has given its name to the area and to its delicious cheese. Come and explore a little town that's been unaffected by the passage of time, built in a superb setting. Discover Gruyères, the most beautiful village in western Switzerland in 2014! Be tempted by our national dish: La fondue in one of the many pretty restaurants in town. You can have the view from the remparts, snap a picture of the castle of Gruyères and Immerse yourself in the world of Fantastic Art. In 1980, HR Giger, a Swiss artist, won the Oscar for Best Visual Effects for his participation in the film "Alien". The museum is located in St-Germain castle, in the centre of the medieval town of Gruyères. Then returned to Geneva by bus.